Some people like to grow things. I take great pleasure in finding ways to make something out of nothing. I think of it as nurturing a found seed and fertile soil into something great. It takes some creativity, a willingness to use Macgyver skills and a dash of salesmanship. I figured I would create a space for such a thing here. 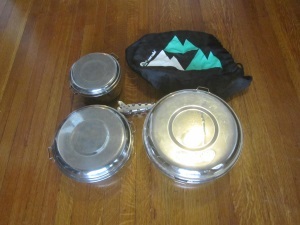 Two months ago one of my tenants threw out an old stainless steel MSR camping cookset. It was dirty but in good condition. I picked it out of the trash can, cleaned it up, snapped a photo and listed it on craigslist for $30. A few days later a couple came and bought it with the intention of using it on for some outings with the Sierra Club. They were taking the Wilderness Basics course with the local chapter of the club and were excited to get the pots. One of my friendly sellers at the swap meet had a box full of junk. Down at the bottom was an older model SteriPen water purifier. I didn't bother to ask him if it worked because I knew he wouldn't know. I held it up and he held up two fingers. Two bucks. Sold. Got it home, popped in four AA batteries and viola, the blue UV light fired when I dipped it in a glass of water. Listed it on craigslist for $25, batteries not included. A college student who was gearing up for Joshua Tree / Grand Canyon backpacking trips offered $20 over the phone. I told him I would wait and see. A few days later he bought it for $25. 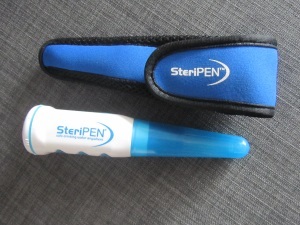 You stole my SteriPen! Did DW throw it out? @Dragline.... I've watched people use them before but this was the first time I got my hands on one. Neat idea. Mr. Twofingers frequently has a pile of backpacks and luggage in his swap meet space. A few weeks ago he showed up with a dirty early 1990s Dana Designs backpack and a leather pilots case. As usual the price was two fingers each. I told him they were worth more and paid $8 for the leather case and $10 for the backpack. 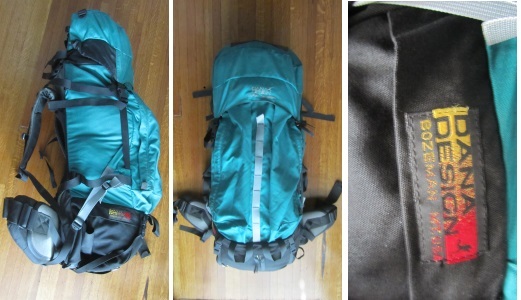 I washed the backpack and soaked it in a mirazyme and water solution to eliminate the slight mildewy smell then dried it and listed it on craigslist for $150. I thought for sure it would sell immediately but it took a week before a middle aged woman called to schedule a time. She told me her story as we tried to fit the pack to her back. She said her father had just passed away. She was his primary caregiver. He moved into her house just as her last child and husband had left. She had been married young and had moved directly from her parents home into her own to became a wife and mother. This was the first time in her life she was alone. She had seen the movie "Wild" then read the book and felt that hiking the Pacific Crest Trail would be a good way to figure out the next step in her life. The pack did not fit her well and I told her so. She was bummed because she had a familial connection to Bozeman, Montana, where the pack was made. I knew it would go to someone interested in military stuff because I've noticed that many of the Navy Seals are now using Mystery Ranch packs (same owner as Dana Designs) and wasn't surprised when a young guy showed up a few days later offering $125. Last month one of my tenants gave notice. He had lived in the apartment for six years and was now moving back to his parents home. As we did the initial walk-through he mentioned that he was worried about getting the bed out. 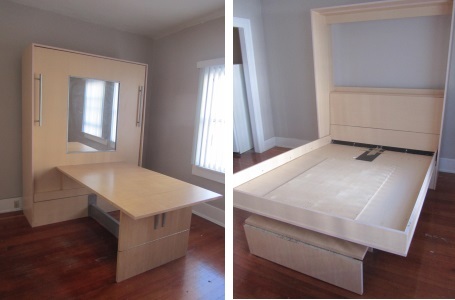 It was a massive freestanding Murphy bed. He said it took a team of movers to get it in and wondered if the next tenant might want it. I hadn't rented the apartment yet and didn't know if others would find it useful so I said no. He then asked what would happen if he just left it. I told him we would have to charge him for removing and discarding it. So he asked if I wanted it for my apartment. We had just purchased our sofabed. I hesitated long enough for him to say, "You can have it.... free." I thought about it for a few moments and realized that I would have about a week to sell it while the work was being completed on the apartment. I tested it and found loose bolts and a very squeaky mechanism. I took a gamble that I could fix it and made sure he understood that I was going to sell it. I could see he was both thrilled and a little guilty, like he was taking advantage of me. Within days we had rented the apartment. The new tenant did not want the bed. We had exactly one long weekend to sell it or I'd be calling friends at the last minute to help me haul it away. @Ego - The hardware on that bed alone is worth $200 (new). I used to do this: http://earlyretirementextreme.com/the-1 ... -bike.html ... usually I'd get the bikes for free because they were broken and then merge them with other broken bikes to make functional bikes. Unfortunately, there doesn't seem to be a local source of free bikes around here. Before placing the craigslist ad I had to figure out the brand name and details of the bed. Turns out the thing still sells for $3500 new. Yikes! So I listed it at the lowball price of $695 with the hope of making it disappear fast. The moment it was listed I got calls, texts and emails galore. Everyone asked if the table could fold away. When they realized that either the table or bed had to be out to create stability, they lost interest. I made two appointments for Saturday, an hour apart. The first couple arrived late and was just about to start negotiating when my phone rang. 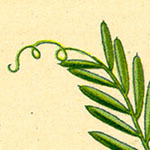 The second appointment. I explained that the other potential buyers had arrived and so the wife whipped out her checkbook and paid full price. It took them and their three teenage sons three hours to get it apart and out. jacob wrote: I used to do this: http://earlyretirementextreme.com/the-1 ... -bike.html ... usually I'd get the bikes for free because they were broken and then merge them with other broken bikes to make functional bikes. Unfortunately, there doesn't seem to be a local source of free bikes around here. Wow. This is strange. 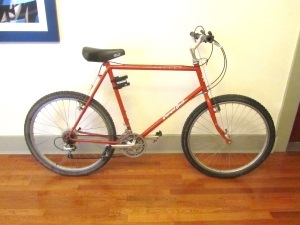 The whole impetus for this thread was the fact that yesterday at the swap meet I bought this 1988 Diamondback Assent MTB for $20 from a couple who trash picked it. I intend to make it into an expedition touring bike. Three years should be enough time to beef up the rack mounts and do the conversion. Love this thread. Very impressive, Ego! Excellent thread! Very interesting to observe how another scavenger works the discard market. 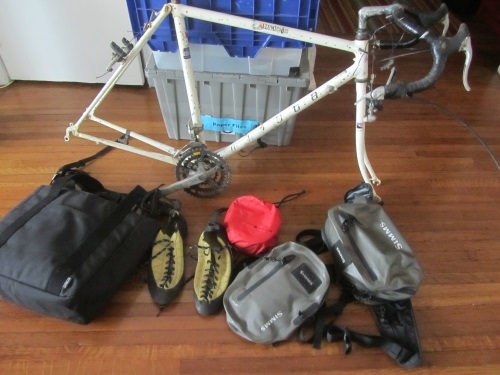 I purchased the bike above with the idea that I would slowly find the parts and pieces I need to convert it to an expedition touring bike over the course of the next year or so. Picture me as the crazy guy at the flea market digging through the parts box with a stick to see if that special bolt happens to be rolling around down there. Expedition trouers are strange bikes. They are a mix of old hardtail mountain bikes but have adopted some elements of cyclo-cross bikes. I nearly fell over this morning when I found an old, wheel-less cyclo-cross bike at the swap meet. Twenty bucks. I asked the old codger where he got it. Another trash picker. 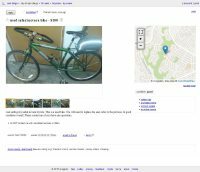 It is a Miyata Alumicross with the exact stem and handlebars (both Nitto), bar-end shifters and brake levers (both Shimano) I want for the tourer. I suspect I'll be able to sell the frame once I strip it. This morning I also found two new Simms waterproof flyfishing packs ($2 each) a Patagonia tote bag ($4) a Snow Peak stainless cookset ($5) and a pair of Madrock climbing shoes ($3). I ordered a few supplies to merge the two bikes and for future projects. A few days after selling the bed I found a used bike on craigslist that was too good to pass up, an REI Novara Safari off road touring bike with a few extra add ons. $100. I called and arranged a time to meet the couple at their storage unit and took Mrs. Ego along for the ride. They were in the process of downsizing. A cute little munchkin was now taking up the space that was once occupied by their skis, bikes, and other non-essentials. They were trying to offload the stuff as quickly as possible to save on the storage fees. I didn't have the heart to negotiate though I am sure they would have gone lower. The moment we saw it Mrs. Ego mentioned with surprise that it was her size. A few months ago Mrs. Ego had purchased a new bike on ebay. Now that the $100 bike was sitting in the batcave she began an elaborate series of hints. The saddle and tube arrived in the mail the same day I bought my project bike at the swap meet. "I am always worried about locking my bike at the grocery store because it was so expensive". "My bike is great but I worry about touring with something so valuable." "I love my bike but it's not fair that it cost so much more than yours." You can see where this is going. Fortunately we bought the new bike at such a good price that we should be able to resell it for a small profit. So it goes. Roommate moved out and left his Weber gas grill. I wiped it down and sold on craigslist for $30. Who keeps taking money out of the pot??? Should we actually pool this money for an ERE event? California really is a paradise for these kinds of transactions. My strategies have been to keep everything cost neutral and focus on repairs instead of trading. So I would buy something that needed TLC, fix it, sell it, and use the profits to buy tools that would allow me to fix more things, etc. A kind of bootstrapping process. However, there's generally much more money in trading (e.g. being first to buy something underpriced and then just turn around and sell it) than in repairs, but trading in NorCal was/is quite competitive. Trading in Chicago is practically impossible. We have people trawling the back alleys for scrap. This city even issues licenses for this scrapping. I think the scrappers turn around and sell it on the flea markets everywhere. We have two weekly ones within a mile from here. Also some undercover garage operations (people are only supposed to have one garage sale per year, but some definitely look more organized/repetitive though I haven't been keeping track). Some of you might remember Ryan from http://recraigslist.com/ ? He's now actively teaching how to do this with appliances in between surfing in HI. We bought our sofa from a couple of guys doing something very similar in Chicago. Subsequently it turned out they sold us a $1500 sofa for $150+$50 to deliver. Nice! They were operating out of a couple of storage units and got their stock from craigslist and estate sales. The only piece of furniture we ever lost money on in terms of owning it was a leather sofa we bought new (duh!) on sale. Another viable strategy to profit is to buy something, typically cars and motorcycles, part them out and list the parts on eBay. 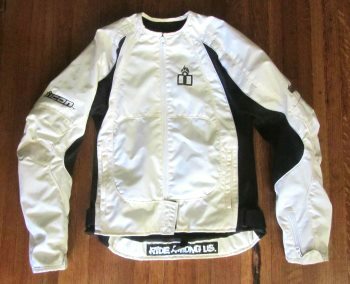 Ego - where are these swap meets that you're able to find this kind of outdoor gear for so cheap? Are you in Los Angeles? More than that. I can't take JL13's thirty bucks and he can't have my six hundred for his party.... no way! I'm selfish like that.